The richer the world of a story, the more you feel you are truly stepping inside it. Vince Fung, Director of Product Marketing at Ultrahaptics, talks about how haptics is adding another dimension to immersive experiences. Theme parks are places of magic and illusion, where we literally step outside our everyday existence and enter extraordinary worlds. But what if, alongside the amazing visual illusions and audio effects experience designers already use, they could create equally incredible tactile illusions? Haptic technology (often shortened to just “haptics”) is technology that synthesizes tactile sensations. It’s a developing trend in immersive experiences, and includes wearables, peripherals, hand-held devices, and innovative technologies such as Ultrahaptics’ mid-air haptic technology. Read on for a whistle-stop tour of the five top ways haptics is adding another dimension to immersive experiences. Innovative haptic technology (here, a haptic vest) advances experiences beyond the basic, ho-hum effects created by traditional 4D techniques such as fans or heaters. 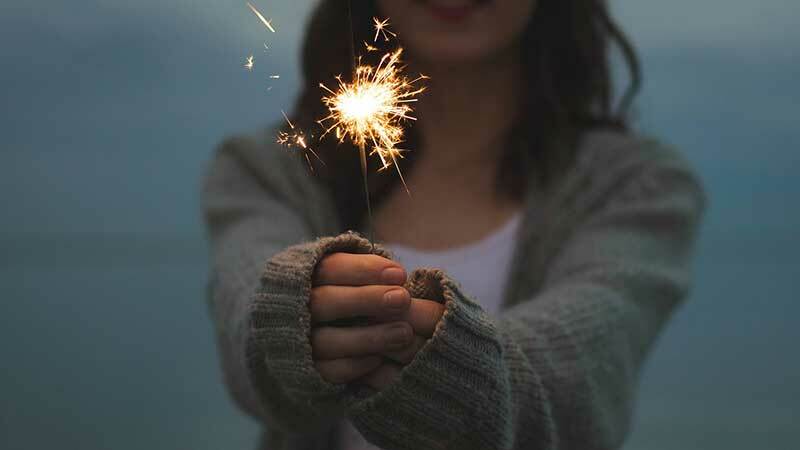 Whether it’s a ghost passing through your body, magic sparkling along your fingers as you cast a spell, or the sensation of a dragon’s breath on your hand, haptic technology creates personalized, dynamic and lifelike tactile effects in immersive experiences. In other words – it makes magic real. 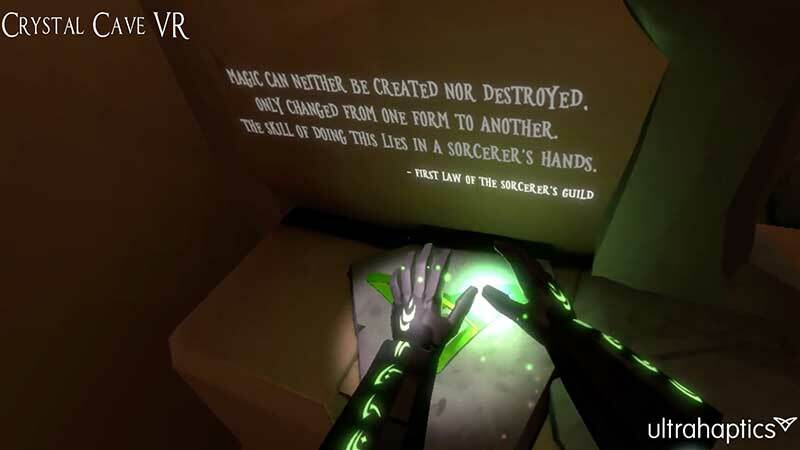 In Ultrahaptics’ multi-user, walkabout VR experience The Crystal Cave, guests feel tactile sensations as they use their bare hands to absorb elemental powers and complete a magical challenge. “Memories made at a theme park last a lifetime,” wrote Stephanie Sampson of Idaho theme park Silverwood Express last year. Touch, one of our five main senses, is an essential ingredient of lasting memory formation. Tactile experiences build memories as strongly as visual experiences do, and more strongly than auditory experiences, a 2014 study by researchers at the University of Iowa showed. Multi-sensory experiences build the strongest memories of all. Watch just how memorable guests found Ultrahaptics’ single-user, walk-up-and-play interactive experience The Energy Chamber at The Magic Castle. They actually feel the energy as it builds, swirls and flows around their fingers. What did you do the first time you tried VR? Chances are, you reached out to try and touch the virtual objects around you. Assuring ourselves of the reality (or unreality) of objects through touch is a fundamental human behavior. 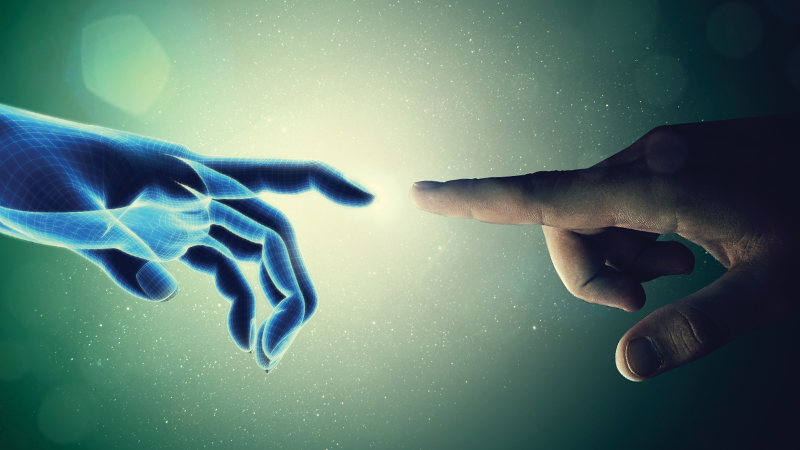 “Humans are confident in the reality of the world more through touch than any other sense,” haptics expert Professor Vincent Hayward explained to us recently. Even small touches of haptic feedback, used at the right moments in an immersive experience, have a dramatic effect on guests’ sense of presence. Watch what happened when VR studio Fallen Planet integrated a few simple mid-air haptic effects into VR horror experience Affected: The Visit. No sense is as intimately linked with emotion as touch. Recent research even suggests that we have specialized touch receptors to carry emotional messages to the brain. Last year, Jessica Clark wrote in online magazine Immerse about the rise of haptic storytelling. Given the connections between touch and emotion, it’s not surprising that who touches who and who touches what have always been vital patterns in storytelling. Now, though, haptic technology makes it possible to incorporate the direct experience of touch (as opposed to mere depictions of it) into immersive experiences. That’s haptic storytelling – and it’s coming to a theme park near you soon. Haptics can be used in brand storytelling not just within rides and experiences but also in the themed environments that surround them. Combine motion tracking, mid-air haptics and digital signage to create interactive queuing experiences and mini-games. Ultrahaptics’ immersive and innovative haptic technology uses ultrasound to create a wide variety of tactile effects in mid-air. No hand-held devices, no gloves, and no wearables are needed. Our haptic technology is particularly well-suited to creating magical sensations in immersive experiences, such as lightning, fireballs, ghosts, clouds, bubbles, and force fields. Haptic modules that deliver dynamically reconfigurable haptic effects can be easily added to location-based AR/VR/XR experiences, dark rides, 4D theatres, and digital signage. To discover more about our technology and its applications in location-based entertainment, download our whitepaper. Vince Fung is Director, Product Marketing at Ultrahaptics, the world’s leading mid-air haptics company, where he oversees marketing for North America and is also responsible for the location-based entertainment sector. He can be contacted here. 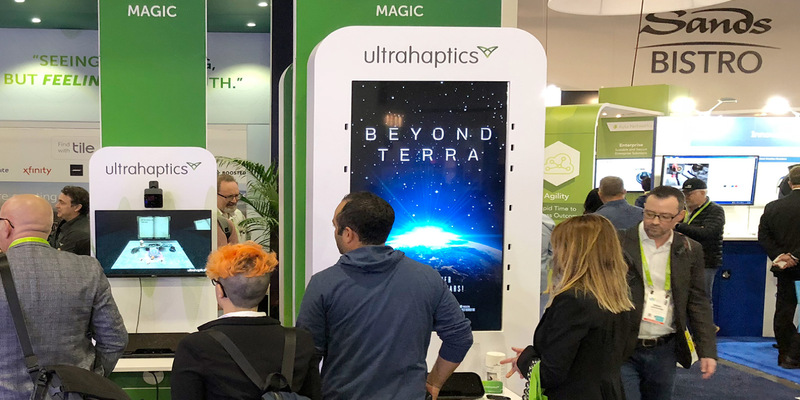 To discover more about Ultrahaptics’ technology and its applications in location-based entertainment, download our whitepaper.